Robert Kiyosaki and Network Marketing are frequently mentioned in the same sentence and yet Robert Kiyosaki isnt even in a network marketing or mlm company! Robert is a highly successful business man and bestselling author. He grew up with two Dads, both with very different views of the world. Both were very successful in their careers and yet one dad struggled financially all his life and the other dad would become one of the richest men in Hawaii. In the book CASHFLOW Quadrant© he covered the four different types of people, E, S, B and I. He explains these four quadrants, why most people are in the E or S quadrant, why you want to move to the B and I, quadrants. 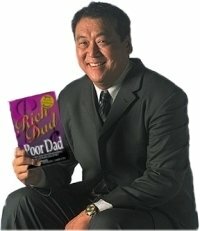 So why do the words Robert Kiyosaki and Network Marketing fit so well together? So how do you find a perfect business that will work for YOU? I can help! You'll discover why life changing Business Education should be an integral part of your Perfect Business! You'll know now how owning your own business allows you to take Control of your Life. You'll learn Why The Perfect Business is a True Equal Opportunity, rather than just for the Upper Class! You'll realize how The Perfect Business will have Friends That Pull You Up, Not Push You Down! You'll understand how The Perfect Business will teach you the Value of A Network and how powerful leverage is to your success! You'll learn what is your Most Important Skill and How to Develop it! You'll learn What it really takes to develop into A Leader. You'll understand the Value of You Not Working for Money, but having Your Money Work for You! Order your Free Robert Kiyosaki - Network Marketing CD today, listen to it in the comfort of your own home and if you like what you hear, contact me for your free consultation. What have you got to lose? "The only difference between a rich person and poor person is how they use their time"
"The size of your success is measured by the strength of your desire; the size of your dream; and how you handle disappointment along the way." "Your future is created by what you do today, not tomorrow"